What are the details of the Ayodhya dispute? How would you begin to assess the significance of the dispute? "Q & A: The Ayodhya Dispute," BBC News, December 5, 2012. Patrick French, "Viewpoint: How India Moved On From Ayodhya," BBC News, December 5, 2012. 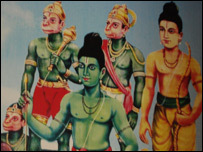 "Ayodhya," Beyond Belief, BBC Radio 4, January 24, 2011. "Ayodhya: A History Of Violence," Guardian, September 30, 2010. "The Mosque At Ayodhya: A Destructive Legacy," Economist (November 26, 2009). Pankaj Mishra, "Holy Lies," Guardian, April 6, 2002. Pankaj Mishra, "Holy Lies (Part Two)," Guardian, April 6, 2002. 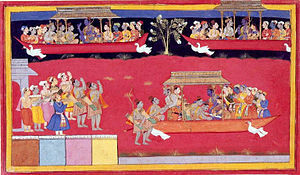 Ayodhya Dispute -- Wikipedia: An entry from the on-line encyclopedia. 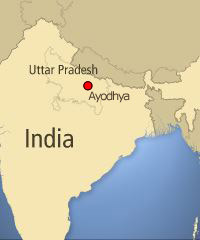 Ayodhya -- Wikipedia: An entry from the on-line encyclopedia. Babri Mosque -- Wikipedia: An entry from the on-line encyclopedia. 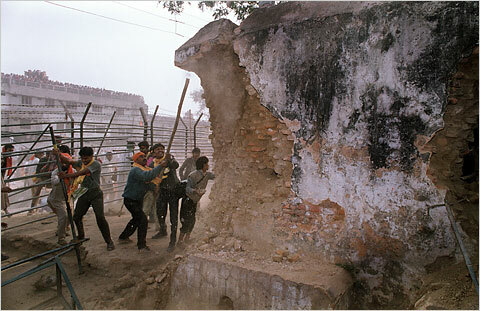 Demolition Of Babri Masjid -- Wikipedia: An entry from the on-line encyclopedia. Ram Janmabhoomi -- Wikipedia: An entry from the on-line encyclopedia. 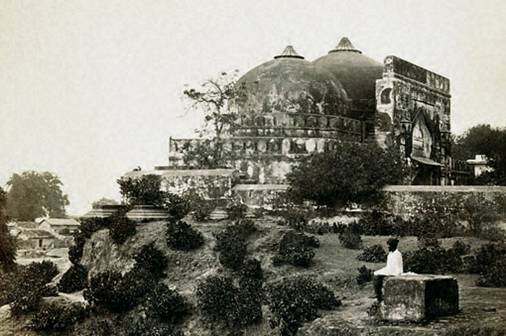 Archaeology Of Ayodhya -- Wikipedia: An entry from the on-line encyclopedia. Yatra 2 Yatra: A Hindu site on Ayodhya. 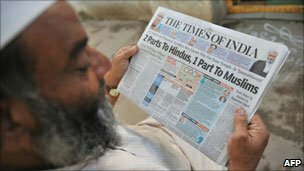 Topic -- Ayodhya, Times Of India: An anthology of recent articles. "Ayodhya: Dispute Over The Holy Site," Guardian: A basic introduction to the controversy. "Why A Controversial Temple Site In India Is Trending," BBC Trending, December 2, 2015. Neha Thirani Bagri, "Memories Of Religious Riots Overshadow Vote in Bihar," New York Times, April 24, 2014. "India Marks Mosque Demolition Day," Al Jazeera, December 6, 2013. "Indian Media: Temple Politics," BBC News, August 26, 2013. 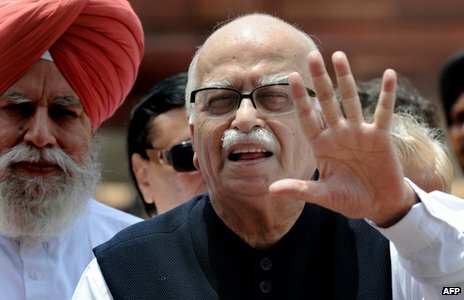 "Profile: Lal Krishna Advani," BBC News, June 10, 2013. 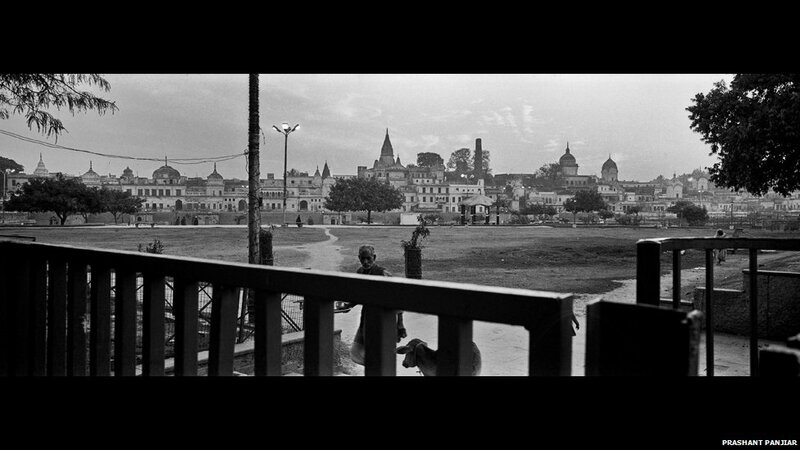 "In Pictures: Ayodhya Life Over The Years," BBC News, December 6, 2012. 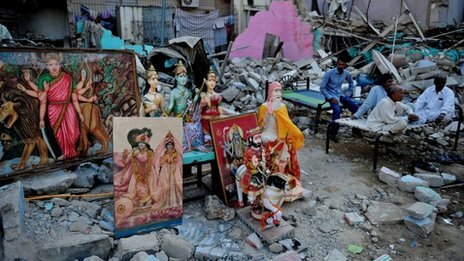 M. Ilyas Khan, "Razed Temple Highlights Pakistan Hindu Woes," BBC News, December 4, 2012. 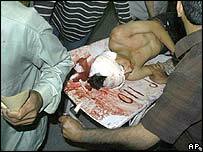 "Court Rules 32 Guilty Over Indian Killings," Al Jazeera English, August 29, 2012. 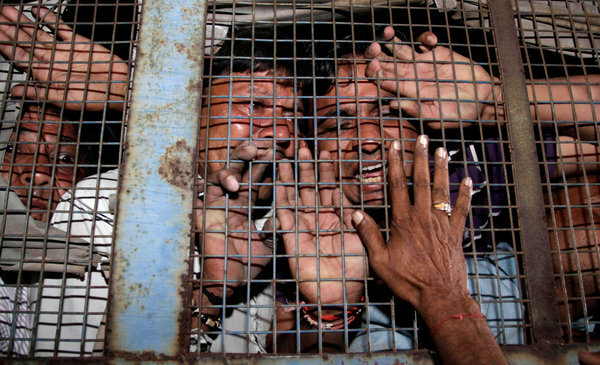 Hari Kumar, "31 Indians Convicted In Violence That Killed Muslims In 2002," New York Times, November 9, 2011. "India's Supreme Court Suspends Ayodhya Ruling," BBC News, May 9, 2011. Lydia Polgreen, "India: Supreme Court Rejects Order That Religious Site Should Be Shared," New York Times, May 9, 2011. "Fresh Appeal Against Ayodhya Ruling," BBC News, December 14, 2010. Dean Nelson, "Muslim V. Hindu Ayodhya Verdict: The History Of The Dispute," Telegraph, September 30, 2012. "Relief In India Over Ayodhya Ruling," Al Jazeera English, October 1, 2010. "India Court Divides Holy Site," Al Jazeera English, October 1, 2010. Ramesh Rao, "Ayodhya Is Emblematic Of Indian Democracy," Guardian, September 30, 2010. Jason Burke, "Security Tight In India After Court Gives Its Ayodhya Verdict," Guardian, September 30, 2010. Vishal Arora, "Politics, Not Faith, Brings Violence," Guardian, September 30, 2010. "Hindus And Muslims to Share Holy Site," New York Times, September 30, 2010. 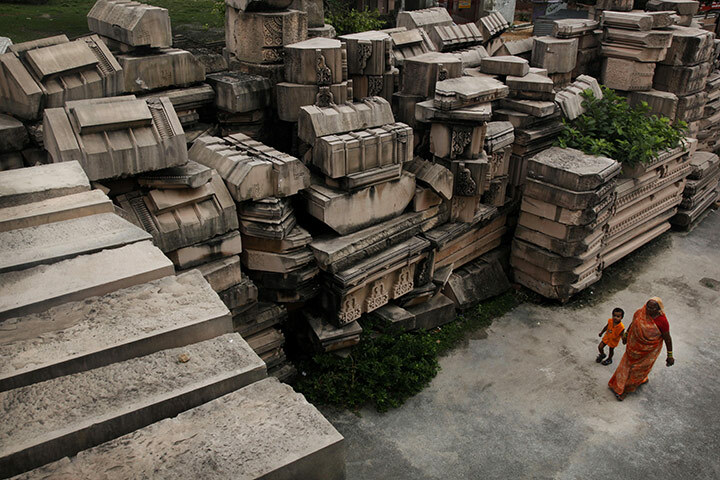 Jim Yardley, "Indian Court Divides Disputed Ayodhya Holy Site," New York Times, September 30, 2010. 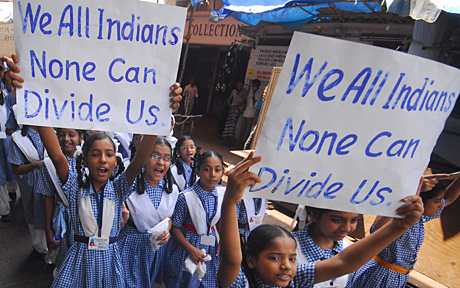 Robert Mackey, "Indian Judges Rule On A Matter Of Faith," New York Times, September 30, 2010. 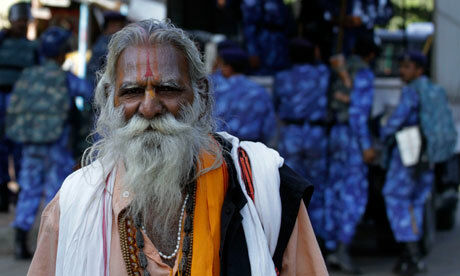 "Ayodhya Verdict: Indian Holy Site 'To Be Divided,'" BBC News, September 30, 2010. "Ayodhya Judgment: Key Excerpts," BBC News, September 30, 2010. Soutik Biswas, "Ayodhya Verdict: A Happy Compromise?," BBC News, September 30, 2010. 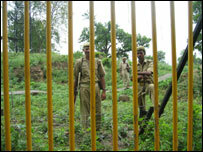 "Timeline: Indian Holy Site Dispute," Al Jazeera English, September 30, 2010. 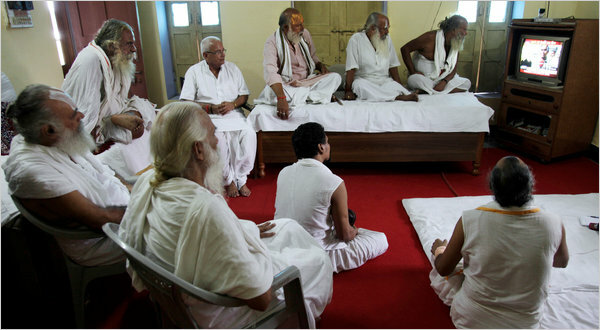 "The Dispute Over The Babri Mosque," Al Jazeera English, September 30, 2010. 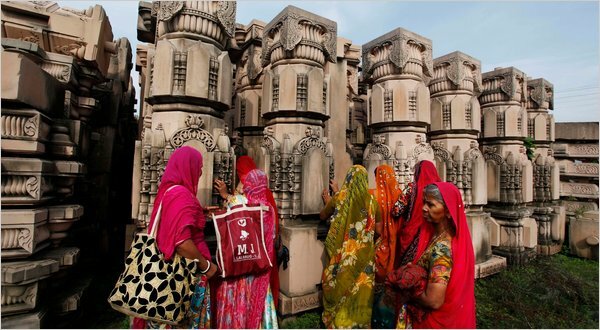 Soutik Biswas, "Ayodhya: Has India's Flashpoint Town Moved On?," BBC News, September 29, 2010. Jim Yardley, "Test Of India Verdict Will Lie In Public Reaction," New York Times, September 28, 2010. 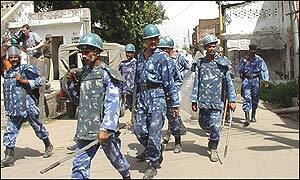 "India Appeals For Calm Ahead Of Babri Mosque Verdict," BBC News, September 17, 2010. "Ayodhya Mosque Report Blames India's BJP Opposition," BBC News, November 24, 2009. 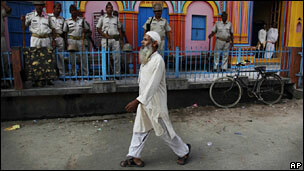 "Uproar Over India Mosque Report," Al Jazeera English, November 24, 2009. "India Parliament Uproar Over Ayodhya Mosque Report," BBC News, November 23, 2009. "Ayodhya Attack Report Submitted," BBC News, June 30, 2009. 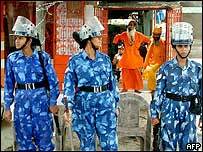 "Security Tight In India Holy Town," BBC News, December 6, 2007. Chris Morris, "For And Against Lord Ram's Bridge," BBC News, November 7, 2007. 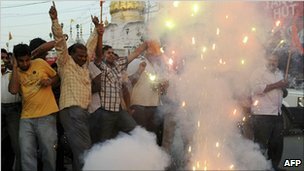 "Hindus Sentenced Over India Riots," BBC News, October 24, 2007. Ramachandra Guha, "A Father Betrayed," Guardian, August 14, 2007. 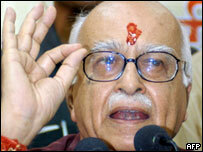 "Advani Charged With Ayodhya Riots," BBC News, July 28, 2005. 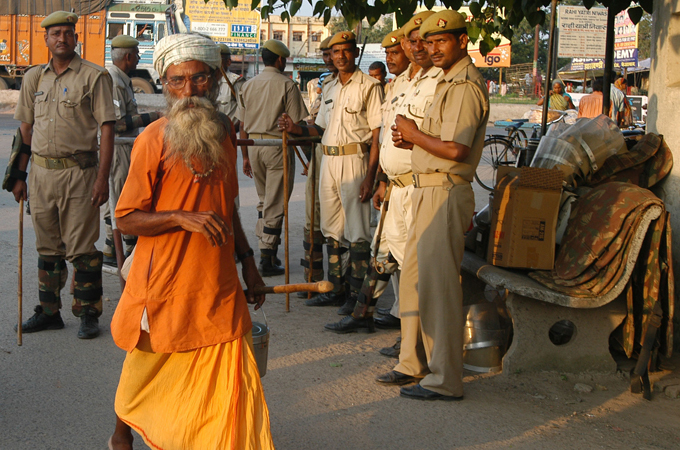 Somini Sengupta, "Thousands Are Arrested In India In Unrest Over Temple Site," New York Times, July 7, 2005. 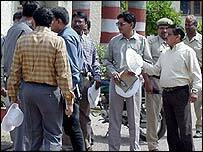 "More Protests Over Ayodhya Attack," BBC News, July 7, 2005. 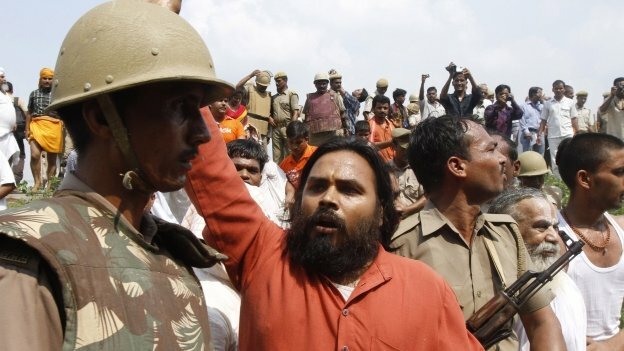 "In Pictures: Ayodhya Protests," BBC News, July 6, 2005. Vir Singh, "Temple Attack Revives Religion In Indian Politics," Christian Science Monitor, July 6, 2005. "Timeline: Ayodhya Crisis," BBC News, July 5, 2005. "Crisis In Ayodhya: History Of A Troubled Land," CBC News, July 6, 2004. "Hindu BJP Stokes Ayodhya Mosque Row," Al Jazeera English, April 6, 2004. 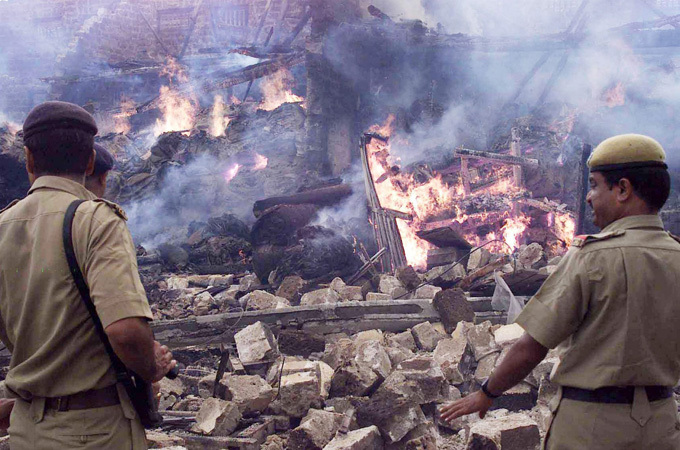 "Ayodhya Anniversary Sparks Riots," BBC News, December 7, 2003. 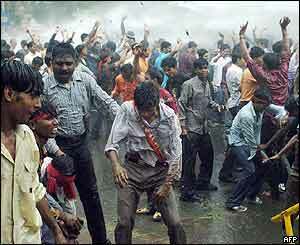 "Rallies Mark Babri Mosque Razing," Al Jazeera English, December 6, 2003. 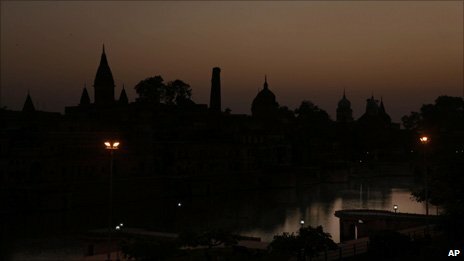 "Ayodhya: The Disputed Site," BBC News, October 17, 2003. 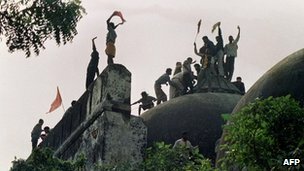 "Dispute Over Ayodhya Ruins," BBC News, August 25, 2003. "Ayodhya Dig Report Completed," BBC News, August 22, 2003. 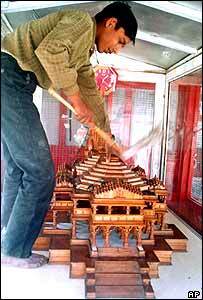 "Fury At Indian PM's Temple Plans," Al Jazeera English, August 2, 2003. 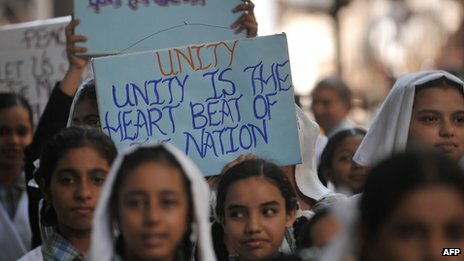 "Muslims And Hindus Discuss Mosque Dispute," Al Jazeera English, July 5, 2003. 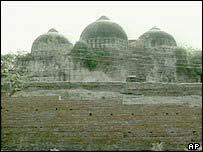 "Ayodhya Dig Yields First Reports," BBC News, March 24, 2003. Seema Chishti, "Can Ayodhya Dig Settle The Dispute?," BBC News, March 14, 2003. 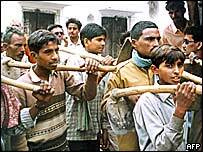 Sanjeev Srivastava, "Digging For Truth At Ayodhya," BBC News, March 11, 2003. Saritha Rai, "Court In India Orders Archaeological Study Of Disputed Holy Site," New York Times, March 6, 2003. "India's Black Day Remembered," BBC News, December 28, 2002. 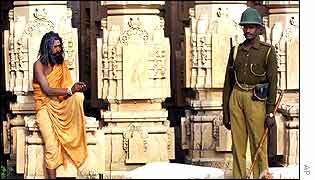 "India Alert For Ayodhya Anniversary," BBC News, December 6, 2002. "Demolishing History In Pakistan," BBC News, December 5, 2002. Ram Kripal Singh, "India's Battered Secular Image," BBC News, December 5, 2002. 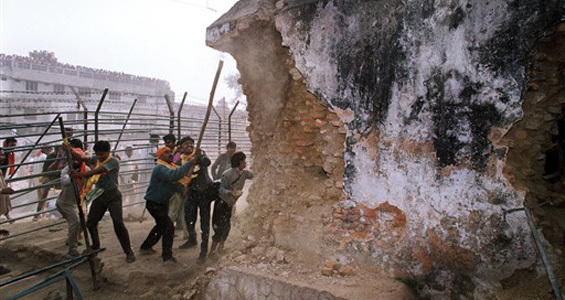 Mark Tully, "Eyewitness: Tearing Down The Babri Masjid," BBC News, December 5, 2002. "The Ayodhya Dispute: What Should The Government Do?," BBC News Talking Point, March 21, 2002. 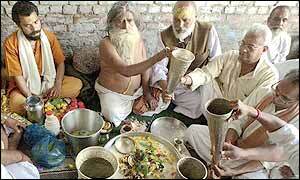 Sanjoy Majumder, "Ayodhya Muslims Live In Dread," BBC News, March 14, 2002. Sanjoy Majumder, "Faith And Passion At Ayodhya," BBC News, March 13, 2002. Jyotsna Singh, "Ayodhya -- The Legal Issues," BBC News, March 11, 2002. 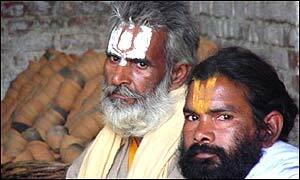 Scott Baldauf, "Hindus Ready For Temple Battle," Christian Science Monitor, March 7, 2002. 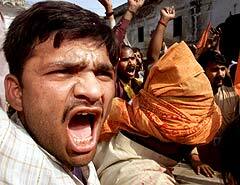 Celia W. Dugger, "Hindu Rioters Kill 60 Muslims In India," New York Times, March 1, 2002. David Little and Scott Hibbard, "Broader Lessons From Ayodhya," Christian Science Monitor, December 30, 1992. Sanjoy Hazarika, "Hindus Are Forced From Mosque Site," New York Times, December 9, 1992. 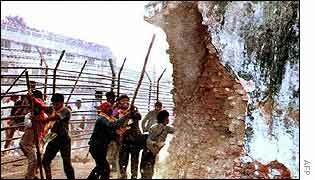 Patralekha Chatterjee, "Disputed Indian Mosque Destroyed By Militants," Christian Science Monitor, December 7, 1992. Barbara Crossette, "20 Die In India As Hindus Storm Disputed Mosque," New York Times, October 31, 1990. "Ayodhya: An Uneasy Split," Economist (September 30, 2010). John Abraham, "Archaeology And Politics: A Case Study Of The Ayodhya Issue," Material Religion, 1 (July 2005): 253-260. Kristin M. Romey, "Flashpoint Ayodhya," Archaeology, 57 (July/August 2004): 48-55. Anuba Charan, "Ayodhya: Digging Up India's Holy Places," History Today, 54 (January 2004): 4-6. "India: Ayodhya's Shadow," Economist (September 25, 2003). "After Ayodhya," Economist (March 21, 2002). "Temple Trouble," Economist (February 14, 2002). Peter Van Der Veer, "Ayodhya And Somnath: Eternal Shrines, Contested Histories," Social Research, 59 (Spring 1992): 85-109. "The Destruction Of The Mosque At Ayodhya," Witness, BBC World Service, December 6, 2013. "Bombing Trial Highlights India's Hindu-Muslim Divide," Morning Edition, October 6, 2006.